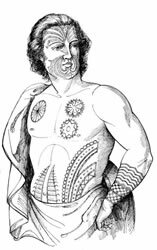 Tribal Tattoos Worldwide looks at the traditional tribal tattoo practices of indigenous and aboriginal peoples around the world and is a celebration of the amazing cultural diversity of tribal tattoo culture. We welcome article and story submissions to be added to our Tribal Tattoo pages. Check out some of these great in depth tribal tattoo articles by our very own tattoo expert Lars Krutak. Pictures & text are from the book "Tribal Tattoo Designs" by Maarten Hesselt van Dinter, Pepin Press. Maarten has a collection of 2000 drawings, pictures and more than 1000 books and articles on cultural anthropology and tattooing. So far he has found more than 110 cultures that one time or another practiced tattooing. Pictures and text used with kind permission.